The terms homozygous and heterozygous refers to specific genetic markers in a horse, which may determine factors related to inherited physical traits, such as health or the color of its coat. Generally, issues relating to heterozygous and homozygous traits are focused on how a horse's genes or DNA affect coat colors of foals for breeding purposes. There are two markers within every equine gene that determines the color of a horse's coat. When a mare and stallion breed, they pass one marker for each gene to their offspring. Genotype refers to the combination of genes the horse possesses. Phenotype refers to the physical color of the horse’s coat or how the gene expresses itself. An allele is one part of a gene. A horse with dominant traits has an allele that expresses itself 100 percent of the time when combined with a recessive gene/allele or a similar dominant one. A recessive gene is an allele that expresses itself only when combined with another recessive allele or the same recessive gene. For example, when studying the tobiano horse, its coat color, or phenotype, is represented by “T,” since it carries the dominant trait. Alternatively, the recessive trait is represented by “t.” A horse’s genotype may be characterized by “TT”, meaning it has two dominant markers in its genes for the tobiano phenotype; “Tt”, symbolizing it has one dominant and one recessive marker within its genes; and “tt”, representing two recessive markers. 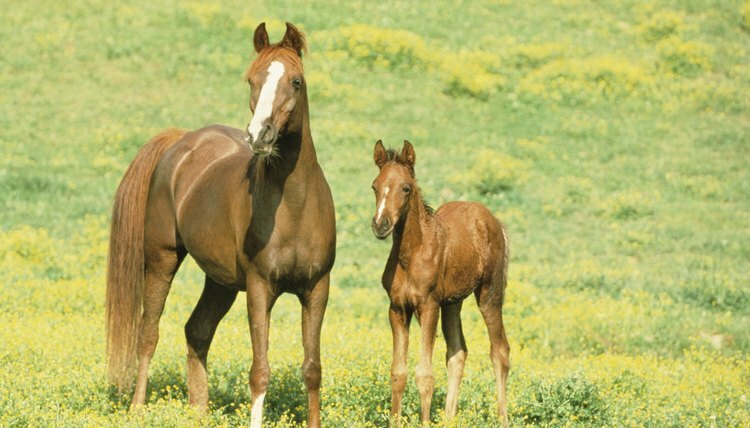 A horse with homozygous traits carries two copies of the same allele in its genes and will produce a foal with the same gene 100 percent of the time. The traits may be dominant “TT” or recessive “tt.” A homozygous dominant horse for the tobiano pattern is represented by TT and a homozygous recessive horse is characterized by tt, meaning it has no tobiano coloring. Only one dominant tobiano gene needs to be present to be passed on to the foal and for the phenotype to be expressed. However, for a foal to be produced with homozygous dominant genes, both the mare and stallion must have the same genotype. A heterozygous horse carries one copy of a particular allele in its genes and will produce a foal with the same gene 50 percent of the time when bred to a horse without the same gene. A horse with heterozygous traits has one dominant allele and one recessive allele within its genotype, represented by “Tt.” When the mare and stallion are bred, the dominant trait or phenotype will be expressed in the foal’s coloring if only one dominant allele is present in either parent. When breeding one homozygous dominant horse (TT) with one heterozygous horse (Tt), both the mare and stallion have the tobiano coloring and there will be a 100 percent chance of producing a tobiano-colored foal. There will be a 50 percent chance of the foal inheriting the dominant homozygous traits (TT) and a 50 percent change of it having the heterozygous traits or genotype (Tt). If two heterozygous horses (Tt) are bred, both parents express the tobiano phenotype and there will be a 25 percent chance of the foal being homozygous dominant (TT), 50 percent chance it would be heterozygous (Tt) and a 25 percent possibility of it having homozygous recessive traits (tt). Additionally, there will be a 75 percent chance of the foal expressing the tobiano coloring and 25 percent chance of it having no tobiano phenotype. A heterozygous stallion (Tt) and a homozygous recessive mare (tt) have a 50 percent possibility of producing a foal with either set of gene markers or genotype. In addition, there is a 50 percent chance it of it exhibiting the tobiano coloring and a 50 percent chance it will present no phenotype for the tobiano coat.